To “First Look” or Not to “First Look.” That Is The Question. Last year nearly 40% of the wedding couples that we DJed for also used us for ceremony music. When you factor in those ceremonies that were on-site but used musicians instead of us, that means over half of the couples we work with are getting married at their banquet facility. The times certainly are changing! time for pictures. All that extra time usually vanishes when the ceremony is at the location because cocktail hour begins right after the recessional. Which is how and why the “First Look” was created. Tradition always said it was “bad luck” for the groom to see the bride before the ceremony. Of course, this stemmed from the days of arranged marriages when the groom didn’t even know what his bride-to-be would look like till he lifted up her veil. He didn’t get to see her before the wedding because no one wanted him to change his mind. Those days are long gone (at least for our typical couples) so why the “bad luck” still exists in some circles is beyond us. First Looks are More Intimate. The traditional moment when the groom saw his bride in her wedding gown for the first time was in a packed church or temple with everyone around. He didn’t really have any time to react or tell her how beautiful she looked because as soon as she got down the aisle the ceremony began. Not that this was a horrible thing but First Looks are better. 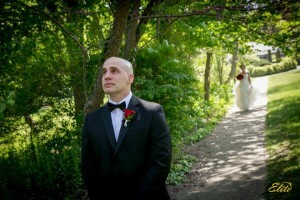 The groom usually turns to see his bride when she is just a few feet away and other than photographers and videographers who are there to capture all the emotion, it’s a very private moment. Many couples are moved to tears and the words they share in those first few seconds can be beautiful and intimate (without a priest or rabbi standing within earshot waiting to get things started). First Looks can be Captured Perfectly. As the First Look became a thing, photographers and videographers became adept at capturing it. Years and years later it has become a specialty for many of them. Wh en there is more than one photographer on the job they will often position themselves perfectly to capture the expression on both the bride’s and groom’s faces. 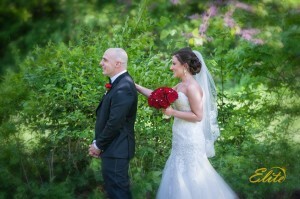 Videographers will often mic the groom so the first few words the couple shares can be recorded. It’s a magical moment that should be preserved and the First Look gives your photographer and videographer every opportunity to do just that. First Looks Leave Time to Relax and Soak in The Day. The wedding day moves quickly. For most couples it’s a blur of emotions and moments and before they can catch their breath we’re playing their last song. Doing a First Look a few hours before the ceremony (again, even if the ceremony is in a church or temple) gives the couple a few more precious hours together on that day and it makes the time between the ceremony and the reception less hurried. If the ceremony is on-site it allows the couple to mingle with their family and friends and enjoy their cocktail hour without having to grab hors d’oeuvres between pictures. Tradition Schmadition! Let’s face it there are many traditional things modern couples have set aside. Tradition said the bride’s parents paid for the wedding. Tradition said you couldn’t live together before you got married. Tradition said you couldn’t, you know, before you got married. Tradition said you had to get married in a house of worship. On and on. As weddings have become more modern there are many traditional things that no longer apply. And the couple not seeing each other before the ceremony should be one of them. It’s an old and outdated custom that just no longer works for today’s weddings. 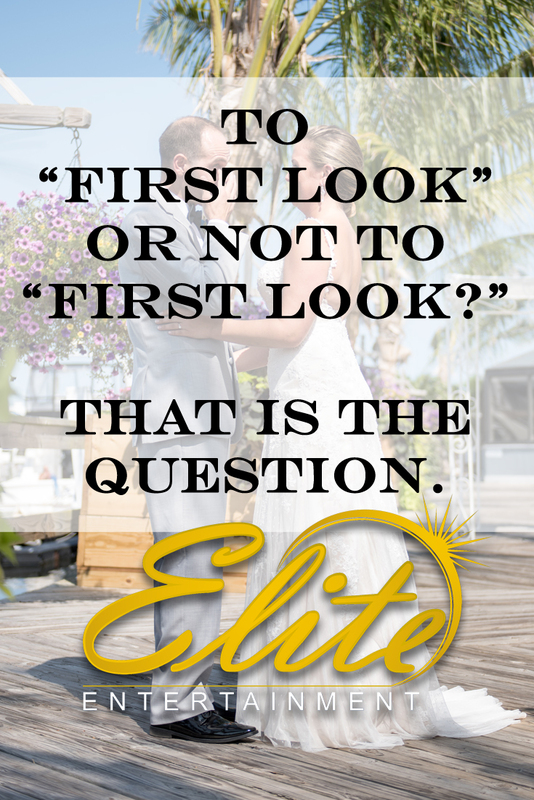 By the way if you want to see a great selection of some of the First Looks our sister company Elite Digital Images has captured check out this Facebook Photo Album.